Mill Park is located 19km north-east of Melbourne CBD and according to the 2016 Census the population is 29,710. With the increasingly popular suburb it is no surprise that in the last five years property value in Mill Park has increased by 68.4% (realestate.com.au). For this family knowing that a kitchen can add real value a lot of thought and research was put into this diy kitchen renovation project. 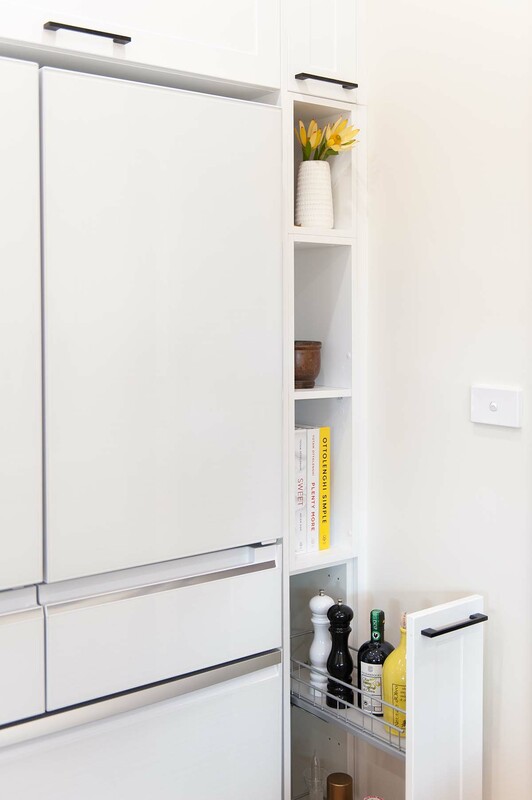 A key priority was budget and the perfect solution was a diy kitchen. Their research discovered Kitchen Shack in Preston where they worked with Mary, the Designer to design a kitchen that met the families needs. This family enjoys daily cooking as well as larger, extended family gatherings where huge feasts are created. 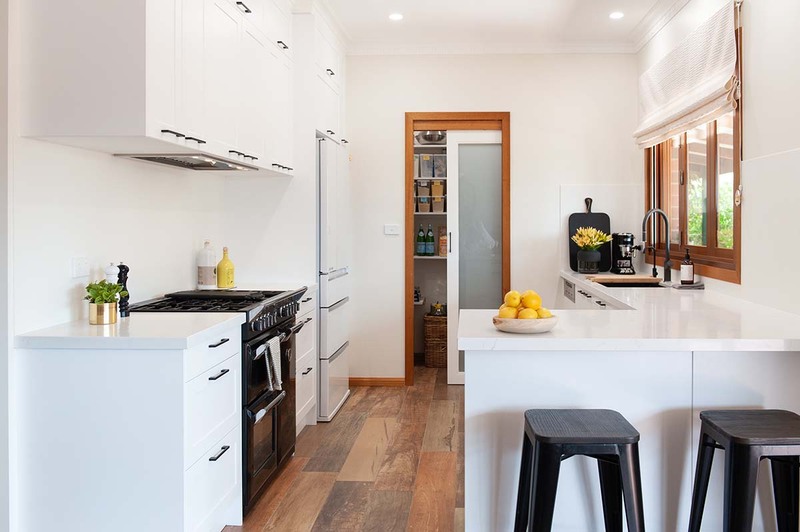 It was important that the design allowed for increased functionality, storage as well as retaining the Butler’s Pantry at the end of the kitchen space. It was determined that an island bench was important so family and friends could sit and chat while the chef was cooking up a storm in the kitchen. It is no surprise that a pull out spice/sauce rack and shelving for those valuable cooking books was all integrated into the design. As displayed the transformation has produced a modern update that is bright and open at a fraction of the price of other kitchens. White kitchens of this shape and design are quite common and will now allow for longevity while the family grows. Occupants: A growing family who enjoys cooking for large family celebrations. The kitchen flow was inconsistent for a family that spends a great deal of time cooking in their kitchen. The white Shaker style door has created character to blend in with the style of the home. The added touch of the Porcelain splashback has created a bright yet soft feel topped off with the modern touch of the black slimline handles. 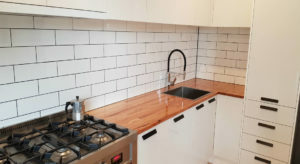 Want to see more before and after flat pack kitchen transformations? 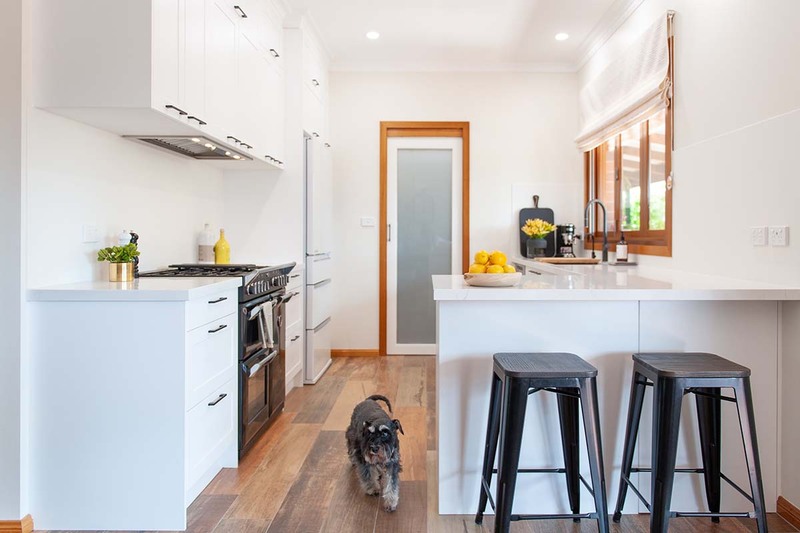 See our kitchen renovation projects in Balaclava and DIY Kitchen Project in Wheelers Hill.